Canadians lay stress on quality education and learning and thus have managed to create one of the finest systems of education in the world today with really high standards. To get an admission for undergraduate studies in Canada, the pupil ought to have completed their 12 years of schooling or academic education, and for an admission into the postgraduate level, the number of years of studies is sixteen. Talking about management students, the pupils might be asked for a work experience of 2 years before getting themselves an admission into the college/university. The GMAT test is compulsory in most cases, for MBA aspirants especially. Although the Canadian education isn't free, when compared to other nations like Australia, USA, UK, etc. , the tuition fees in Canada is much cheaper overall. A visitor's visa would be needed for studying in Canada for courses, which extend longer than 6 months. It's important to find out what kind of visa would be needed, complete the application for the visa and get the approval before arriving here. Immigration processes becomes easier if you get a degree from Canada (you get credit for it). Tuition fee for graduate programs is approximately between 6,500 and 50,000 CAD per year. The duration of programs ranges between 3 and 4 years for undergraduate courses and between 1 and 2 years for graduate courses. Jobs Petroleum Engineer, Transport Manager, Lawyer, Construction Manager, Health Policy Consultant, etc. are some of the top jobs in Canada. A UK education offers top quality course curriculum, research opportunities, and internationally recognized degrees. More than 450,000 students from across the planet come to pursue various courses and degrees in the UK. Top jobs in the UK are corporate managers, directors, flight engineers, aircraft pilots, medical practitioners, etc. The tuition fee is one of the heaviest expenses a pupil has to bear for studying in this country. Like for example, for an international student, the approximate tuition fee for a year for pursuing an MBA degree is almost £ 15,100 for a year apart from other expenses. Most of the undergraduate degrees in the U.K. are three years long, except when we talk about Scotland where it is 4 years long. The master's degree in the U.K. is normally a one year program. 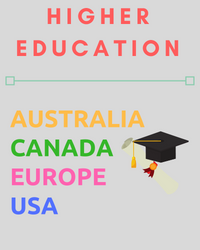 At a given time around 545,000 international students are enrolled in various programs in Australia. The education system is very diverse and quality of education is top notch. Majority of the students are from China, India, Vietnam, South Korea, Thailand. The pupil ought to have completed their 12 years of schooling or academic education. One can pursue either a 2 yr associate degree program or a 4-year degree program. For fulfilling the requirements for proficiency in English, you'll have to take the IELTS or the TOEFL. Foreign students need an Australian student visa for a course extending 3 months. To get a student visa you'll have to pursue a full time program in Australia. The tuition fee and the living expenses here are comparatively lower than the U.S and UK. The cost of a post graduate study program in Australia for example would be somewhere between AD $15,000 to AD $36,000 for a year apart from other fee. Course duration here ranges between three and four years for an undergraduate program and 1+ years for a postgraduate program. Skilled trades-people, engineers, sales representatives, Management/Executives, financing and accounting staff, technicians, IT staff etc are some of the top jobs in Australia. About 30% of all international students today currently, across the globe are pursuing studies in the US. America has one of the most flexible and versatile education systems in the whole world. For the graduate and the post graduate courses, the eligibility and requirement are same as Canada's, 12 years of schooling for pursuing graduation and 16 years of studies for pursuing a post-grad degree. Some institutes also accept 15 years of studies for courses like MBA. You need to have great scores in exams like GRE, GMAT, SAT, etc. as well as a minimum score requirement in TOEFL and IELTS. One needs to apply to a college/university, basically an education institution which has been approved by the popular US Citizenship & Immigration Service. The tuition fee in the US can range anywhere between USD $10,000 and USD $55,000 for 1 year approximately, and this excludes the other expenses like accommodation, food, books, groceries, medical insurance, etc. The undergraduate courses are 4 years long while the graduate courses are 1+ years. Jobs in fields like management, advertising, finance, dentistry, software engineer, etc. are some of the top jobs in America. With more than 4,000 colleges and universities to take a pick from, spread across more than 30 countries, you will always find a course of your choice for pursuing a degree in Europe. Apart from the scholarship, pupils can directly apply online for getting an admission in to a post graduate or an under graduate course across any university/college in Europe. You should be passed out although from an esteemed university/college of your country. Studying in Europe is cheaper for the residents of EU than the non-EU pupils. For example, the cost of tuition fee in Germany is around 500 EUR for each semester, in Greece it's nearly 1,000 EUR for a year for non-EU pupils, in Denmark, it is 10,000 EUR for a year for non-residents, and in Spain, the fee starts at nearly 950 EUR for each credit. Thus the fee depends from one college/university and country to another. The duration of course ranges between three and four years for an undergraduate course and above one year for a postgraduate program. Financial managers, doctors, airline pilots, bank analysts, etc, are some of the top paying jobs in Europe. If we carefully see, UK, Australia and U.S lay stress on English proficiency exams a lot and for applying to universities in all these 5 nations/continents, a minimum of 12 years of schooling is a must for pursuing graduation and around 16 years of education is a must for pursuing post graduation. In Canada, you'll need a visa for studies that go beyond 6 months while for Australia it is 3 months and more. For a visa permit for studying in EU, you need to submit various documents while for applying to the UK it depends upon the kind of degree you're pursuing. For the US on the other hand, it's different than the rest.Cost wise Canada is the cheapest while Australia, U.S, Europe and even the U.K are on the expensive side. The master's degree in the U.K. is normally a one year program, while generally across the world getting a master's degree is a 2-year program. The undergraduate courses are 4 years long in the U.S, while in other countries they're mostly between 3-4 years. If we see above, then the maximum average salary drawn per year is by the Australians, followed by Europeans and the least average in the group is Canada.The quality of studying in all the countries is top notch as higher education pursued from good colleges; from all the above-mentioned countries/continents has value across the globe. Management jobs are the ones that are the most in demand in these highly developed nations, and so are jobs in the software engineering field as well doctors/dentists tend to make a lot of money in these countries.